Do you remember a few weeks ago I shared photos of Kiku the elephant that artist Chris Chun painted? Chris is a lovely person and a talented Australian artist who lives a wonderfully creative and enviable life in Chiang Mai, Thailand. I’m delighted to interview him and share his colourful inspirational images in this week’s Space to Create post. I live in Chiang Mai, Northern Thailand. My partner and I have been based here for over 2 years and we are having an amazing time here so far. My partner has never lived overseas before and he wanted a sabbatical to write a book. So we travelled for six months through Japan, Cambodia, Laos, Myanmar before settling here. Chiang Mai is a ‘just be’ place – a very easy place to live. The city has a very peaceful and unique charm about it. I think it must have something to do with there being over 700 temples here. It’s hard not to feel like you’re on holiday all the time! The people are very friendly and the lifestyle is much more relaxed than in Australia. I can’t begin to tell you the benefits of how good you feel having a Thai Massage every few days. 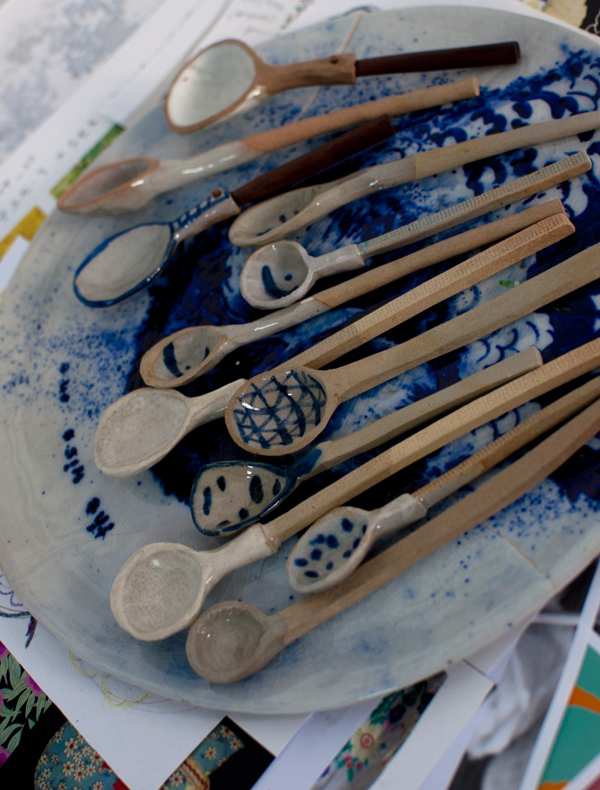 One of the things I especially love about living here is connecting with the rich community of artisans and craftspeople. 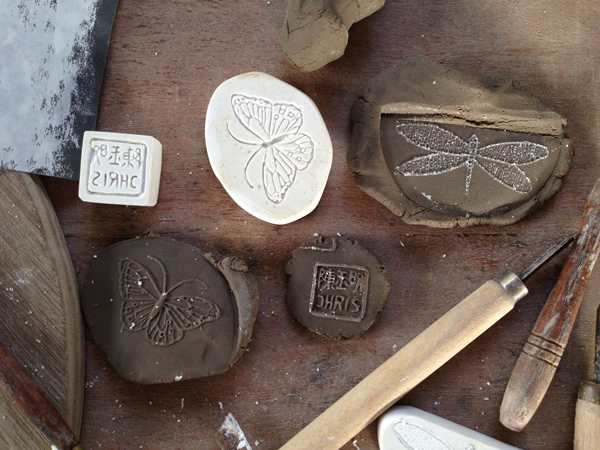 I’ve been learning how to make ceramics again and doing etchings with a local workshop which has been lots of fun. 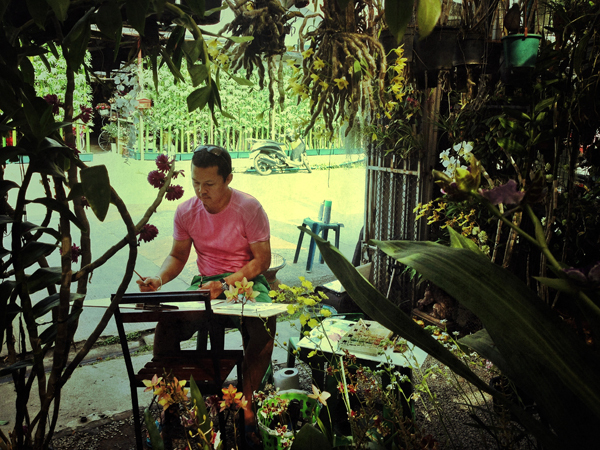 I have 2 studios here in Chiang Mai – one is for my design work and another outdoor one for my canvas paintings (and elephants) where I can get very messy. The only problem is that it can get very tiring working in 38 degrees celsius heat (despite 3 fans going non stop)! I pretty much work everyday but my schedule is very flexible and my hours can vary greatly. I love what I do so it doesn’t feel like work and I think this is one of the secrets to living a happy life. I find I tend to work in really intensive blocks for 1 or 2 months, and then I might have a week where I just work a few days here and there. The only thing I don’t do is paint at night as I prefer to paint during daylight. I want to make sure that the colours I use are the right hue and shade. I have always been quite creative from a very early age. I remember in Grade 2, the teacher took black and white image shots of us and asked everybody to cut out the face and stick it on to a piece of paper and draw what you want to be when you grow up. As expected for that age group (particularly in the 1970’s), the girls were drawing air hostesses and boys were drawing fireman and policeman. I wanted to be a tooth fairy so I sketched a tooth fairy with hat, wings and a matching wand. Behind me there were shelves with little jars housing teeth. My journey is probably a bit too long to answer here so you may like to listen to an interview here I did with Monica Lee from Smart Creative Women. (Sometimes, she also has smart creative men too in case you were wondering). Just briefly, I exhibit professionally as a fine artist; I have an exhibition coming up here in Chiang Mai later this year. 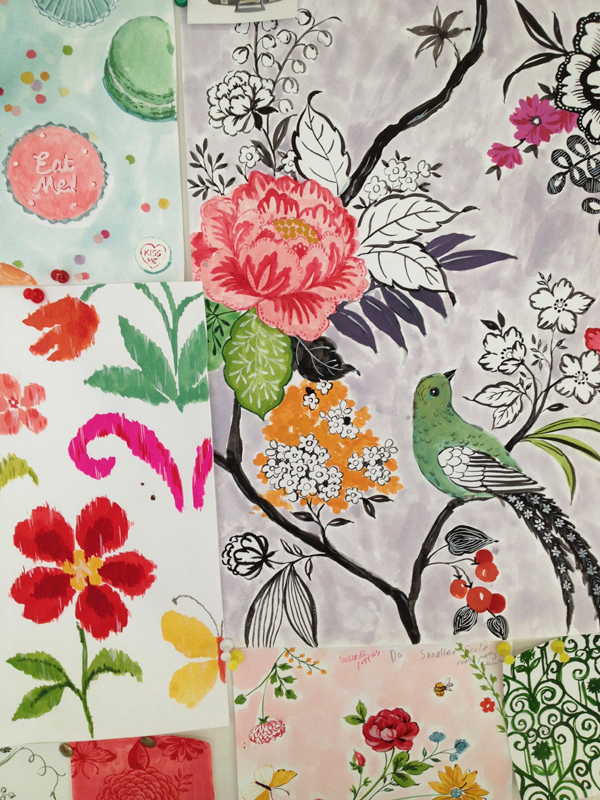 I license my artwork to companies worldwide on a variety of different products like stationery, textiles, and ceramics. And I also work as consultant to a few select companies helping them with designing their products. I am an artist and designer. My work is inspired by the beauty of the natural world, and nature’s infinite charms. I have exhibitions and I also license my artwork to create beautiful products for a select group of companies worldwide such as ceramics, stationery, textiles. Fun, Adventurous, Insightful, Creative, Optimistic, Loyal. Anywhere and everywhere. I know it sounds cliché but it’s true. One of my greatest sources of inspiration is of course, travelling. I love exploring new cultures and meeting new people. I think I have about 20,000 photos on my computer from the trips I’ve taken in the past year. I also look at blogs occasionally to see what is happening in the world but mostly it is just from living here in Thailand. 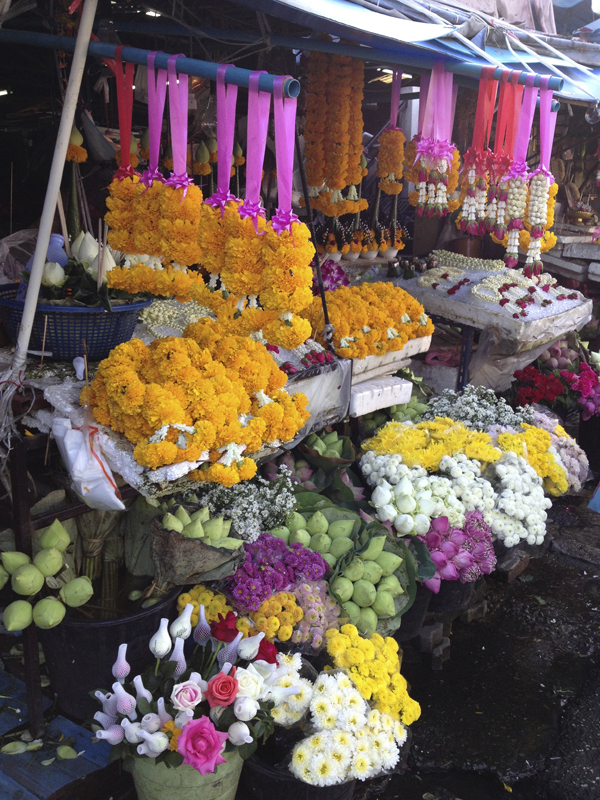 Around the corner to my studio is Kamtieng Flower Markets, which has the most amazing selection of orchids. I have been sketching there and now I am using these in some of my upcoming projects. Lately, I’ve been listening to podcasts from TEDx, Grace Bonney from Design Sponge ‘After the Jump’, Smart Creative Women and Big Hearted Business whilst I paint. I love learning from other creative people and finding out more about their journey/ practices. As a creative person, it is hard to stay motivated all the time and it’s natural to get ‘creative blocks’. If I do get stuck or feel like I am in a rut, I usually take a break for a day or two and come back to it. If I am on deadline, I will go and have a massage or read a book for a couple of hours – just something that relaxes me and takes my mind away from it. Fast internet connection, good natural light, my Apple computer, Wacom tablet & pen, scanner & printer, my lightbox desk, paints, paper, large pinboards and lots of art/ design books and reference material if I’m lucky. And air conditioning! Be brave and just start. The scariest thing is actually starting the process. We all tend to think about things too much and get so worried about how our work will look. Don’t be so critical of your work at the beginning. Enjoy the journey. “Dear Chris, Thank you for your beautiful, ethereal and calming art which I happened upon after a particularly horrible hospital appointment when looking for images of butterflies and nature. Distilling the beauty of nature into your art is otherworldly; helping me to get back to me”. One thing I must stress is do not blatantly copy anyone else’s work. It’s not only disrespectful and but also illegal. It’s OK to be inspired by someone else’s work but make sure you put your own handwriting on it to make it your own. And with everything you produce or create, make sure you absolutely love it! This is your best seal of approval. I would love to design a hotel. I would collaborate with an architect and be involved in creating everything from the bedlinen to the tiles in the bathroom to the food we serve in restaurant and the overall service/ ambience. I’ve travelled a lot and I think this would be lots of fun to do. Online boutique (limited edition products, original artwork). Facebook (for daily updates/ new work). YouTube (Chris’s videos on painting). Catch up with previous Space to Create posts.